More bull from Red Bull? A popular saying in the English language, but a saying people are more likely to associate with the Britpop band from Manchester, Oasis, due to it being the title of their hit song Don’t look back in anger. Ironically, this played as I read through the story of Kovalainen’s Lotus stint at the end of 2013 and how this affected his 2014 drive chances. Of course Fernandes did forget to include the bundle of cash that also came with Kobayashi’s signature, which given their failing to secure 10th in the World Constructors’ Championship last year really became a deal breaker, or more importantly a deal maker. The Caterham head honcho does raise an interesting point though, as who, if anybody, really benefited from Heikki Kovalainen driving for Lotus at Austin and Interlagos? Primarily, what kind of message does this send to your reserve/test driver? Davide Valsecchi, a youngster with what seemed to be a fledgling career and the 2012 GP2 Champion, was turned down in favour of a driver who in truth has already had his chance at showing what he could do. Valsecchi’s career has now taken a step back with him now seemingly ready to exit the Enstone setup, and as has been reported, still is without his salary. If his potential move to Indy Car does happen, he would likely never return to the F1 paddock. The final nail in the coffin of Kovalainen’s Formula One career was hammered in with the poor showing, but could he really have expected any different? Jumping into the race seat at a team where he was unfamiliar was always going to be a challenge, and in the end proved to be one too far as he failed to get anywhere near the points as Grosjean picked up 2nd in Austin and was forced into an early retirement in Brazil. Even if you take into account the poor luck he had with his car he still was humiliated by the late season charge of Romain. Then there is Lotus, who with hindsight would surely have made a different decision on drivers and had a chance of securing 3rd or even 2nd in the WCC. However, the writing was on the wall before the Caterham man arrived at Enstone as one Finn was never going to be a direct replacement for another. Furthermore, any parts for the 2014 season that were tested would have been less reliable if done so by Kovalainen and not the Italian, Valsecchi. The only winner in the whole situation has to be Kimi Raikkonen, who abandoned a sinking ship and the embarrassment of further confrontation with race engineer, Alan Permane, as well as being beaten again by his teammate. He must have been laughing all the way to Maranello! The situation at the time required a bit of common sense to be applied, something which seems to have been lacking at Enstone for some time. Fernandes said the treatment of Kovalainen had seemed “cold“, although at the top tier of motorsport cold is how you need to be sometimes. I wonder if Lotus, Kovalainen and/or Davide Valsecchi look back in anger? Following this year’s test in Jerez, many jumped to the conclusion that the reason for the Red Bull overheating was due to the tight packaging of the side pods. History clearly demonstrates Mr. Newey has previous in such matters. The MP4-18 never came to be due to having smaller sidepods, which caused heating problems and despite being lightning quick, it failed the crash tests and was too unreliable. Many of the car’s radical innovations made it into the design for the MP4-19, but the first attempt was a failure and the team weathered the season with a heavily revised previous model, the M4-17D. For this project, Mike Coughlan was brought in to assist Newey with the car – something that could only be done at McLaren due to their management structure and system of hierarchy. Can you imagine this happening at Red Bull with the leadership there? The RB3 saw a space savingly packed gearbox cause problems on the car, leading to overheating. The car had been designed too aerodynamically without enough consideration of issues beyond pure pace. This does not sound too dissimilar to the 2014 Red Bull racer, where Ade has not been controlled in the extremeness of his design. The fact that the 2014 challenger was rushed doesn’t help, too, which is another parallel to the RB3. Back then it wasn’t the design that was rushed, but the hasty opening of the wind tunnel in Bicester, which caused the designers to base their creation on less than reliable data. Newey’s relationship with the management at Williams became tense at the end of his tenure there, mainly due to his desire to become the team’s technical director there. Not having to share the power has been one of Newey’s strongest aspects at Red Bull, but could this also be the reason for Peter Prodromou wanting out? At McLaren the Red Bull chief aerodynamicist would have been assured of a more equal working relationship. 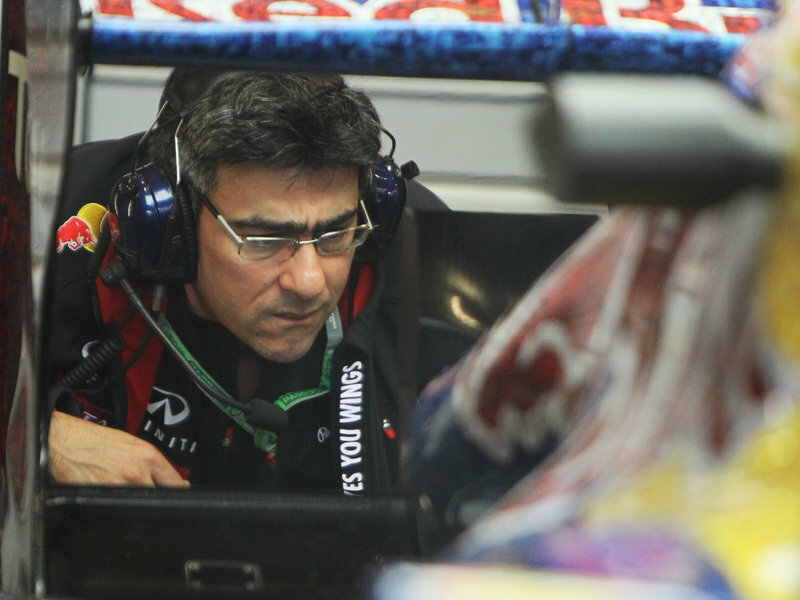 Is Prodromou’s love affair with Red Bull over? A bundle of cash or a promise of a more senior role seems to have convinced Prodromou to stick with the Milton Keynes team for the time being, but how long will this last if success does not follow? Furthermore, how will Newey react to having the reins put on him? The reports still circle of him being interested in designing an Americas Cup entry in the not too distant future. Whatever criticism can be leveled at Newey one thing is for sure, at least he is consistent! He continued to say there could be “some very exciting announcements of big companies” in the near future. It seems the positive sentiments have not escaped Norbert Haug, the former Head of Mercedes-Benz motorsport, who like Bernie Ecclestone also believes Mercedes are in good shape. What a difference a few months can make. Haug’s change of mind is like when enough time has passed between former lovers and now the rose-tinted glass shields the negativity of yesteryear. It would appear time really is a healer as Haug seems to have moved on, although it must be hard to see the team fighting at the front having put so much hard work in, only to be outed in scapegoat fashion before the recent success came their way. Now two weeks since doctors started trying to wake Michael Schumacher, the F1 legend remains in a coma. That is the news of the German daily Bild-Zeitung, reporting that while the seven time world champion has often presented reflex twitches since the anaesthetic was reduced, Schumacher is still not responding to deliberate stimuli. However, Bild said the former Mercedes and Ferrari driver’s wife Corinna – who is at his bedside on a daily basis – is following the doctors’ advice by continually talking to the 45-year-old, as there is evidence it can help a patient in Schumacher’s condition. The report also claimed the newly retired Ross Brawn, who worked closely with Schumacher during the ultra-successful Ferrari era, visited the famous driver’s bedside, slipping in almost unnoticed by the media last Thursday through the staff entrance. Meanwhile, it is believed that French investigators into the skiing accident are preparing to reveal their findings, with Bild citing ‘legal sources’ in believing the file will simply be closed. Former team driver Antonio Pizzonia has backed Williams to bounce back into competitive form. The fabled British team has struggled for success since Jacques Villeneuve won the last title in 1997. But for 2014, Grove based Williams has the highly-competitive new Mercedes V6 on board, the title-winning technical chief Pat Symonds, and long-time Ferrari driver Felipe Massa. Not only that, Brazilian Pizzonia said he has heard that Williams is investing heavily in other, less high-profile areas of personnel. “Look at the history — it is a team that can win,” Pizzonia, who as Williams’ test driver substituted for injured Ralf Schumacher and Nick Heidfeld in 2004 and 2005, told Brazilian radio Jovem Pan. “What has surprised me most, knowing Frank Williams, is that he has invested a lot on the technical side of the team,” he explained. “They are hiring new people, significant people, which is financially not cheap for the team, and if you analyse the history of the team, they haven’t done it much before. “They have always sought to promote young people in their own factory who could have a bright future, but I think now we could see a very strong improvement,” added Pizzonia. He said Williams’ decline dates back to his own time at the time, some 10 years ago. “There were relationship problems with BMW, the team was losing competent people and then there was the financial side with the loss of strong sponsors and from there the situation got worse. “In recent years they even had to go down a path they’d never gone down before, which was to have paying drivers. “But I hope now we see a turnaround and the team goes back up again,” said Pizzonia. He also commented on F1 more generally, including the recent complaints of some active drivers who are unhappy with the sport’s reduced speed due to the new engine and aerodynamic regulations. “There’s two sides (to that),” said Pizzonia. “For the young drivers it will be much easier to adapt, because the leap from GP2 and the World Series is much smaller. But I think there is some frustration for some drivers who see that Formula One is going backwards in terms of speed. But I understand that F1 is doing it for safety and for a range of other factors. “As a spectator though I have to say I am not really in favour, because even on TV the speed reduction is apparent. It’s not as cool as it used to be,” said Pizzonia. Austria’s return to the F1 calendar this year is on track, Red Bull supremo Dietrich Mateschitz says. “We are striving for a perfect race weekend with sold out grandstands,” said the Austrian billionaire, who has rebuilt the former A1-Ring circuit. There had been some minor doubts about the race’s return, as the Red Bull-Ring was initially limited to a small maximum crowd, while circuit upgrades were still in the planning. “The construction is on schedule, even if it is tight, and the permits are all in place,” Mateschitz told the Salzburger Nachrichten newspaper. With world champions Red Bull arguably the biggest spenders in pit-lane, Mateschitz also commented on the hardening plans for team budget caps for 2015. “At the moment the question of what is excluded and what else the manufacturers can redeploy in other budgets is still open,” he said. “On one hand, billions were spent on the development of the new engines, which is not questioned,” added Mateschitz. Finally, he was asked about Ferrari’s explosive ‘fire and ice’ new driver pairing of Fernando Alonso alongside fellow champion Kimi Raikkonen. “Even if there are frictions,” Mateschitz insisted, “it has to work. Lotus may have internal power struggles raging between Andrew Ruhan and Gerrard Lopez, and new Russian investors who want to control the team’s PR crew, but the same old problems at Red Bull rumble on. In previous years around this time we’ve seen the good doctor Marko snipe at his German protégé’s drivers’ team mate – who decided enough, was enough and buggered off to the World Endurance Series. A difference of opinion between Marko and Horner rears its head from time to time as it did prior to the launch of the RB9. Marko was published in the in-house magazine, the Red Bulletin, criticising Mark Webber. He said of the Aussie, “Red Bull puts him in a car – a possible winner – and suddenly along comes this young kid and he snatches the booty from under Mark’s nose”. Adding, “It seems to me that Webber has on average two races per year where he is unbeatable, but he can’t maintain this form throughout the year. And as soon as his prospects start to look good in the world championship, he has a little trouble with the pressure that this creates. In comparison with Seb’s rising form, it seems to me that Mark’s form somehow flattens out. Then, if some technical mishap occurs, like with the alternator for example, he falls relatively easily into a downward spiral”. Yet Horner has on a number of occasions hidden behind the ‘misunderstanding’ explanation or following Marko’s nigh on weekly missives on Servis TV where utterances from the Austrian described as ‘lost in translation’. Today Christian Horner faces the world to explain how his team are fairing following what can only be described as one of the most disastrous 4 days of testing in Formula 1 history. Mmm. Last week the good doctor told the world that Ade was performing major surgery on his latest creation as he “has to redesign some elements in the rear of the car”. Unfortunately the SKY reporter today didn’t joined up the dots and should have questioned Horner over the discrepancy between his “tighten up on” and Marko’s “redesign… [a number of] elements”. “Lost in translation”, would probably been the reply. Note Horner quickly deflects the problem away from Red Bull by including Renault in his response. Yet the truth is Red Bull are working night and day to solve a number of problems that their installation is creating the Renault engine; problems which the Caterham and Toro Rosso do not have. Further, a classic motivational strategy is in play. The Bullite troops are being marched up to the top of the Red Bull mound, the standard is raised and in a monotone drawl are informed by Christian that their enemies can’t wait to see them fail – a classic siege mentality approach. If this is the case, then there may be some truth in the rumour that Sir Alex Fergusson was sighted on Friday quietly exiting the rear door of Christian’s office this weekend, after a coaching session on how to control his foot soldiers in a crisis. Still for now the willing minions are manning the machines on double shifts, possibly with free Red Bull provided for extra productivity. Strangely quiet is the in-house shrine where daily worship to Ade is offered. Newey has stated himself that he has doubts as to whether he can fix the RB10 to a point where he is satisfied. But for now, according to Christian the team merely needs to “tighten up a few things”, and that is all we need to know. Whilst Caterham finished bottom of the pile in 2013, their rookie driver Marcus Ercisson is not phased by stepping up from GP2 to Formula 1. Marcus Ericsson has been competing over the past few years for a GP2 team capable of winning races, yet he joins an F1 team who have never scored a point and finished bottom of the pile in 2013. His mentor, Eje Elgh – himself is racer, suggests that Marcus should take time to “understand his place” in Formula 1 and strike the right balance between trying to make a quick name for himself and carefully building a reputation. Ericsson himself admits he will have big decisions to make, such as, “Can I drive round the outside of this guy at 250kmh or not?”. When questioned who he felt he should avoid on track, the young Swede total Eurosport Sweden, “Maldonado’s got a reputation for being a bit crazy”, though adding, “there are not as many wild mindsinF1 as in GP2”. Having Kobayashi as a team mate will give Marcus plenty to think about, as the Japanese driver has a reputation for attempting banzai moves and leaving you with a little “Kamui Kiss”. Yet its interesting that Crashtor’s reputation is already influencing the thinking of a rookie F1 driver, who has been in close combat with pretty aggressive drivers like, Johnny Cecotto Jr. Still, unless Caterham and get their act together it will be a moot point whether either of their drivers can get alongside anyone else at 250kmh, unless being lapped. Is Prodromou definitely staying at Red Bull and not going to mclaren now then? I read on james allen’s site it was only a possibility about a week ago. Did think it sound a bit strange the stories of him staying. Especially as mclaren have just parted with their current chief aero guy from what I believe! That’s just talk for “We don’t want him having an impact on the 2015 McLaren Honda project” towards “Newey’s off to design boats, panic stations”. It seems that the Red Bull party bus has crashed! Unsettling news regarding Schumacher. As time goes by, one begins to lose hope for his recovery. Miracles can happen. Let’s pray that he finds one and somehow comes back from this…. It is very unsettling Steven. I do pray for him but sometimes, with an accident like this… What if he wakes up in a wheelchair? That said, someone like Schumi will probably do something amazing and inspire even more people! W/ Schumacher’s accident, I think the only reasonable course for non-family/uninvolved folks to take is to hope for the best but expect the worst. Nothing about what’s been reported factually or implied/insinuated indicates there will be a “happy ending” here (ie, MS recovering to be MS again). And b/c it’s not an externally-visible (simpler?) trauma like Zanardi’s loss of his legs, but rather, insidious Traumatic Brain Injury, it’s not like the the recovered-patient will necessarily manifest the same personality, intellect, speech/diction, emotions, etc. In the brain resides the fundamental essence of who we are as people – and a TBI scrambles that. OBVIOUSLY, W/o a DOUBT I hope I am wrong and that old Michael Schumacher wakes up from this, maybe just w/ a propensity for headaches or blurry vision or something equally minor. I’ll say again though – of course we hope he recovers fully, have great respect for him, compassion for his family, etc. etc., no disrespect here, etc. etc. Not sure if pseudo emotional is a correct term for what some are going through Joe. This is another generations Senna moment, but with the added dimension of being drawn out over time. I agree, there may be bandwagon merchants channeling the vicarious pain and sadness of others – this is always a factor and makes fascinating studies to get to the why – but there are many genuinely emotionally invested individuals in Michael situation. Very nice final paragraph too. For sure, Colin. Thanks for pointing this out. “pseudo-emotional” is NOT meant to be disrespectful, and I appreciate your providing valuable insight and context. I was just trying to draw a distinction b/w the effect of personally knowing and interacting with someone who is aware of and interacts w/ you, vs. being a passive or indirect recipient of a public figure’s influence (in this case a race car driver). It’s not exactly the same, but is still similar, hence why I was advising Schumi’s fans to gird themselves to respond to the worst (while still hoping for the best). I haven’t read any other news today so I’m not aware of any additional MS-related reporting, and if things are going better and he actually is responding, well that’s great!! If that’s still not yet the case, well, like I said, I appreciate your sharing your insights and also hope my response has addressed any doubts you might’ve had about what i was trying to convey. Having been fortunate enough to travel and visit cultures who display many of the traits of 19th century England – in life expectancy, disease, lack of health car, little technology…. I am consistently reminded how for them death and the issues or mortality are a daily part of life…. …Yet in more developed societies there appears to be generally a more disconnected attitude to these issues and a greater sense of immortality prevails. So when the transience of life is encountered personally, it manifests in a more highly dramatic and emotional manner…. I ski and have done so for 30 years. I even competed way back in the day (ha ha clue??? ), and will be taking the family away for a week starting this weekend. Over the years as I’ve aged, the risk of serious personal injury has been more prevalent in my thoughts as I hurtle down a mountain on a couple of planks. Though this may be due to concern for the smaller members of my party and their invincible attitude to the days ‘play’. This year, the people who know me and have known I ski for years, (most of them non-skiers) are advising to make sure I wear a helmet – something they never thought about previously. Interesting how in developed cultures the power of celebrity/fame and the global nature of the news is creating a common consciousness. The legacy will always live on in a pub somewhere! Perhaps that’s the one good that comes out of this, if Schumacher’s recovery is to an undesirably-hindered state: public consciousness and discussion, driven by media coverage & commentary (in all its various forms), of the serious consequences of Traumatic Brain Injury and the associated risks from the activities like skiing (and American football, for example) where you’re at-risk for it. Like I said, I’m not familiar w/ the state of the research debate (if any) re. helmet use in skiing, but as a snowboarder, I’ve ridden w/ a helmet since 2007 and certainly feel much safer wearing it. Actually though I would credit a pair of ‘Crash Pads’ Pro-Pant 2500 (w/ integrated tail shield – a coccyx protector) as having made the most significant safety-impact on my snowboarding. I’ve fallen hard enough to severely bruise my coccyx twice: once w/o crash pads and once w/, and I only wish I’d known about integrated tailbone shielding℠ lol when I’d started boarding! oyoyoy. If I have time later today I might look up some data & analysis on helmets for snow/ski and see what I find…it’s fascinating how counterintuitive some of this stuff can be and shows why policymakers and journalists alike have a responsibility to consult w/ (hopefully) impartial researchers who can provide scientifically-valid analysis that goes beyond gut wrenching personal stories and exceptional case histories. Oops, I didn’t mean to double-post that aphorism. d’oh! I don’t think Fernandes needs to justify KK over HK. HK was only ever going to be reliable… At least KK is liable to be fast on occasion. I’ve never seen anything attributed to Haug since he was ousted to suggest he was bitter. In fact, my impression was one of total magnanimity. For the experienced driver seat.. it was money or no money. Not surprisingly, money won. But Tony could have had more cash – VDG was the most of all 3.. but he wanted a new variable, so went with Ericsson/Frijns. They might have that raw adaptability that could snag them a point, to go with KK’s overtaking as well. HK’s pace was still good but I guess not enough to justify a seat, when Lotus races put his stamina into doubt (well, more a lack of seat time with a heavy fuelled car), and Di Resta is also not in a seat with a lack of cash (now a younger version of HK). The point is Lestyn that both HK and PDR have had more than ample opportunity to prove themselves in decent or top level cars. VDG saw the light, that Caterham and Marussia have almost no chance of catching the midfield teams with the current prize money structure. —I definitely can’t argue w/ this, and let’s not forget, HK was at least a 1 GP-winner! Iirc, HK’s own words indicated some regret that during the early days of his F1 career, he wasn’t doing something as ‘right’/properly as he’d come to do later (don’t remember the exact details, but i do seem to recall him reflecting on this…but I could be wrong, so treat w/ caution – oh! I think it might’ve had to do w/ being managed by IMG?). Anyway, I don’t fault KOva in the least for taking the Lotus drive, b/c there was no guarantee that he had a race seat anywhere in 2014 (let alone a competitive one) – even if he may’ve had some kind of a contract – or not! As you say, Adam, HK had his development chance at the top, and it’s unlikely at this age that he would’ve unlocked previously unrealized personal potential. But if he’d managed to pull of a great drive in the Lotus, that could’ve boosted him back into a full-time racing role. That it didn’t is a bummer for fans of his like me, but at the same time I’m totally glad he went out w/ a fight, actually driving, b/c i know from personal experience that even if you’re not going well, you’re at least still going. It would’ve been a 100x worse to have NOT taken the Lotus drive and then STILL have been flicked by Caterham! At least he took the chance and got to fight one more battle. That he didn’t succeed isn’t even that reflective on his ability/fitness/skills/training, since it’s established fact that jumping into a car w/ which you’re totally unfamiliar is not gonna end well. Indeed Joe, it was always more likely that Caterham would take two paying drivers (like 2013), just with one being more experienced. It’s unlucky for HK, but I believe McLaren totally focussed on Hamilton in 08-09. Rosberg turned down the McLaren number 2 seat (at the time, you would think ‘would he ever get a better chance’?) to remain Williams number 1, and now at Mercedes supposedly gets an equal billing with Hamilton. The evidence is that HK was always a top driver (RoC wins, FR3.5 and GP2 etc.) so if he could have given his best at McLaren we would have a different impression of him. He definitely got 100% out of the first few Caterhams, that’s for sure. The environment there really suited him, whereas McLaren didn’t, which does happen for some drivers (think Frentzen not doing well at Williams, but great at Sauber and Jordan). True, although in some past times I think di Resta would have gotten a break, maybe that solitary McLaren year that Perez got by bringing 5m. Possibly Kovalainen could’ve continued too, if his form didn’t tail off in late 2012 (as I think he saw the writing on the wall and pretty much gave up). Heikki and Timo Glock could have done better than Petrov at Renault most likely, in 2010-11, so that would have been a better end of their F1 careers for them than being stuck in the backmarker cars (at least Heikki got two more races to end on). It’s also true on VDG – and Tony could have picked him over Ericsson, if he wanted a few more million dollars for the budget. VDG’s rumoured 15m could definitely bag a Sauber seat in 2015. Sutil will probably still be going with his backing, and Gutierrez depends on the Mexican connection, with Sirotkin the same with Russia. So Sauber are covered, with 4 paying drivers for 3 or 4 seats! That’s interesting, I never thought to compare HK & Glock to Petrov when he was at Renault…he was the original “Crashtor” (!! ), eh? Petrov had some epic wrecks, eh boys? Sauber…nice. 3-4 drivers w/ cash in-hand – can’t complain! @Ctp – Fernandes seems too much like a nice guy and not cut throat enough. This has also been the case with his decisions for QPR, the football club he owns in England. Yeah, he did admit that. I think he was eager to get stuck in and secure QPR in the Premier League (also before FFP rules come in), which they actually managed for a season. Now, more controlled in the championship they are looking good for a return to the PL (where they should then just buy a top striker or two, maybe Zamora/Johnson are past it now). I’m assuming Newcastle will finally buy Remy off them in the summer (eases the wage bill, opens a space up), else they will be looking backwards next year without a good midfield signing too..
Lestyn, financial fair play rules only matter for those who want to compete in Europe. If not, you can spend away! I think it’s great that (seemingly) Newey has cocked up with RB10 (I still think it should be RBX). You don’t hit home runs unless you are swinging for the bleachers. The best agents in any field fail occasionally – letting them do so is actually a good idea. The amount riding on this apparent fail is no doubt a cause for concern in more than a few corners of the RB empire, but they’ll get over it. If you knock the edges of genius you no longer have genius. It’s the extremities that make the difference. Lotus gets new partner Yota Phone. As always, follow the money. Sigh. Good spot Verstappen, not a fat lot happens in Russia without that man knowing about it and giving it his blessing. So Horner and Newey keep saying it’s all Renault fault for what happened in Jerez , Marko said that the car will undergo major changes before Melbourne. Newey complain about new rules to put engines on a primary role, Horner said that the car will not change so much. Three RB men saying three different things, that’s quite interesting..
Cooling the whole thing has always been Newey’s kryptonite, the FIA saved him once by giving them dispensation to use more liquid tanks, which caused the whole “communicating vessels” discussion. This year the grand wizard of aero is on his own. Can you post a link to where I can read more about what you say about FIA helping out Newey with liquid tanks and ‘communicating vessels’. I’m always interested in technical controversy. Red Bull/Renault had cooling issues, and got dispensation from the FIA to use a system whereby it changes the fluid levels of two tanks between qualifying and the race. But they used it mainly to change the balance of the car between qualifying and race day. Will look for a link, and post it for you. Judge, It’s a- me, Enzo! 3 links puts it into moderation…. It looks as though Lotus ran all 100Km of their promo day..what do you make of this? Is it a case of Renault fixing the problem or were they just running at reduced power, like Caterham did on the last day of the first test? Renault updates on course for Bahrain ….. Reduced power would be a fair take; happy to be proven wrong though. Just seen that grandprix247.com have a little to say on the Lotus workout…TBF comments section there doesn’t seem to be altogether engendered towards their article though. FWIW…? P.S. – I don’t have an AutoSport subscription otherwise I’d have posted more than just a link. Adam Cooper swallowed it too. Press releases, somewhere a little south of 100% of the time, mean sweet very little. I’m always amazed that all the nuclear armed countries that tested the bombs tested them so close to their own people! But things were not as well understood back then. An example is the early British Jet industry planes failing from what is now known as metal fatigue. Interesting reading Joe – I knew about Bikini Atoll and nuclear testing but had no real conception of what happened. Rendering me helpless and in great despair. thanks for sharing the video. will check out that clip now.